GE Marine announced it will provide Buquebus, Buenos Aires, Argentina, with a customized service agreement for the two GE LM2500 gas turbines aboard the Francisco fast ferry. The 10-year agreement provides for scheduled and unscheduled maintenance for the dual fuel gas turbines that power the world’s fastest commercial ship. Under the customized service contract with Buquebus, GE will provide for scheduled and unscheduled gas turbine maintenance, including onsite and field service support, select component repair and replacement, engineering, technical and troubleshooting support and engine leasing. In addition, any depot level work will be performed in Italy at Avio Aero’s Brindisi facility. Avio Aero is a GE Aviation business. On June 15, 2013, Francisco achieved 58.21 knots, making it the fastest commercial ship in the world. 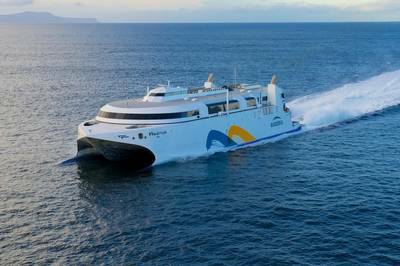 Built by Australian shipyard Incat, this 1,516-metric-ton displacement catamaran can carry more than 1,000 passengers and 150 cars on each voyage. The two GE gas turbines enable the vessel to achieve speeds in excess of 50 knots during normal operation on LNG or marine gas oil.